200 - 400kms ❖ 3000m - 5000m ❖ 5 nights/6 days ❖ from 2200€ pp. The Ardeche is really an unknown entity in the cycling world. The locals love it. The Tour de France rarely visits the region and usually only in the touristy areas of the Ardeche. We, on the other hand, ride here a lot, and we know where to go to avoid the tourists. Trips during July and August should be avoided as the heat can be a bit much. Late May, June, September and early October are ideal. The areas that we ride in are remote, hence a sit-down lunch in a restaurant may not happen, so we must pack our lunches. Did we mention the heavy traffic? See top photo for confirmation. Ride Difficulty 5-7/10: The Ardeche week can be described as moderate to a little demanding, depending on where you normally ride and your training. The name of the area is the Regional Parc Monts d’Ardeche. Nothing is flat here. Having said that, nothing is really that difficult either, as long as you like climbing gentle hills. Climbs on average can be 12+ kms and gain 500m or more. The biggest day has an (optional) 16k climb at 5.4%. Like we said, easy, (some of you may disagree with this statement). 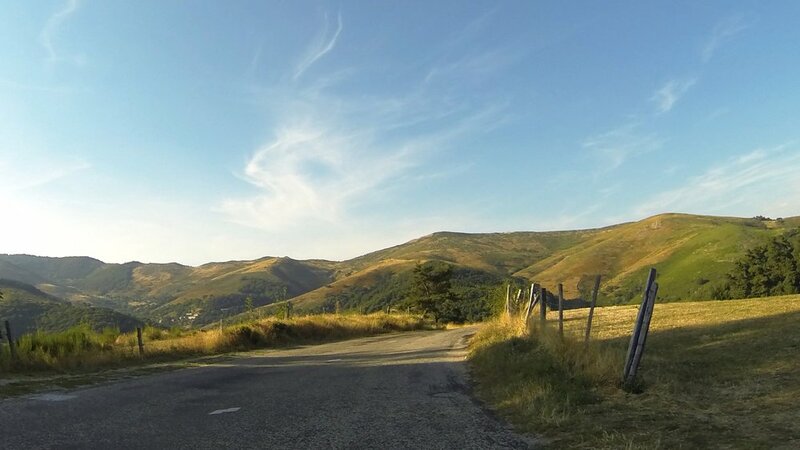 Day 6: A short loop ride around Vals les Bains (then a 2 hour van transfer to Avignon) or a 40km bike ride to Privas, (then a 90 minute van transfer to Avignon), where your Ardeche trip ends. Those of you with the where-with-all may want to have a prolonged trip with TTT. We have at least another 5 days of riding here (including 3 more days from the first hotel!). We know that you will be wishing that you took this option when you signed up.